The geography of France consists of a terrain that is mostly flat plains or gently rolling hills in the north and west and mountainous in the south (including the Pyrenees) and the east (the highest points being in the Alps). Land use in Metropolitan France, with urban areas shown in red, 2006. Natural resources of France. Metals are in blue (Al — aluminium ore, Fe — iron ore, W — tungsten, Au — gold, U — uranium). Fossil fuels are in red (C — coal, L — lignite, P — petroleum, G — natural gas). Non-metallic minerals are in green (F — fluorite, K — potash, T — talc). (Metropolitan - i.e. European - France only, French National Geographic Institute data? The region that now comprises France consisted of open grassland during the Pleistocene Ice Age. France gradually became forested as the glaciers retreated starting in 10,000 BC, but clearing of these primeval forests began in Neolithic times. These forests were still fairly extensive until the medieval era. In prehistoric times, France was home to large predatory animals such as wolves and brown bears, as well as herbivores such as elk. The larger fauna have disappeared outside the Pyrenees Mountains where bears live as a protected species. Smaller animals include martens, wild pigs, foxes, weasels, bats, rodents, rabbits, and assorted birds. The upper central part of this region is dominated by the Paris Basin, which consists of a layered sequence of sedimentary rocks. Fertile soils over much of the area make good agricultural land. The Normandy coast to the upper left is characterized by high, chalk cliffs, while the Brittany coast (the peninsula to the left) is highly indented where deep valleys were drowned by the sea, and the Biscay coast to the southwest is marked by flat, sandy beaches. Regions and departments of Metropolitan France in 2016. France has several levels of internal divisions. The first-level administrative division of Integral France is regions. 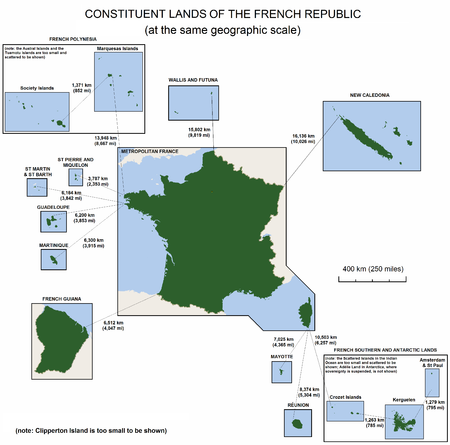 Besides this the French Republic has sovereignty over several other territories, with various administrative levels. Metropolitan (i.e. European) France is divided into 12 régions and 1 territorial collectivity, Corsica. However, Corsica is referred to as a region in common speech. These regions are subdivided into 96 départements, which are further divided into 332 arrondissements, which are further divided into 3,879 cantons, which are further divided into 36,568 communes (as of 1/1/2004). Five overseas regions (régions d'outre-mer, or ROM): Guadeloupe, French Guiana, Martinique, Mayotte, and Réunion, with identical status to metropolitan regions. Each of these overseas regions also being an overseas département (département d'outre-mer, or DOM), with the same status as a département of metropolitan France. This double structure (région/département) is new, due to the recent extension of the regional scheme to the overseas départements, and may soon transform into a single structure, with the merger of the regional and departmental assemblies. Another proposed change is that new départements are created such as in the case of Réunion, where it has been proposed to create a second département in the south of the island, with the région of Réunion above these two départements. Four overseas collectivities (collectivités d'outre-mer, or COM): Saint-Pierre and Miquelon, Saint Barthélemy, Saint Martin, and Wallis and Futuna. One overseas "country" (pays d'outre-mer, or POM): French Polynesia. In 2003 it became an overseas collectivity (or COM). Its statutory law of 27 February 2004 gives it the particular designation of overseas country inside the Republic (or POM), but without legal modification of its status. One sui generis collectivity (collectivité sui generis): New Caledonia, whose status is unique in the French Republic. One overseas territory (territoire d'outre-mer, or TOM): the French Southern and Antarctic Lands divided into 5 districts: Kerguelen Islands, Crozet Islands, Île Amsterdam and Île Saint-Paul, Adélie Land, and the Scattered islands (Banc du Geyser, Bassas da India, Europa, Juan de Nova, Glorioso, and Tromelin). One uninhabited island in the Pacific Ocean off the coast of Mexico which belongs directly to the central State public land and is administered by the high-commissioner of the French Republic in French Polynesia: Clipperton. This is a list of the extreme points of France; the points that are farther north, south, east or west than any other location. French Guiana is an overseas region of France, located on the northern coast of South America between Suriname and Brazil. See also the article on the geography of Suriname. The economy of Saint Pierre and Miquelon, due to the islands' location, has been dependent on fishing and servicing fishing fleets operating off the coast of Newfoundland. The economy has been declining, however, due to disputes with Canada over fishing quotas and a decline in the number of ships stopping at the islands. In 1992 an arbitration panel awarded the islands an exclusive economic zone of 12,348 square kilometres (4,768 sq mi) to settle a longstanding territorial dispute with Canada, although it represents only 25 percent of what France had sought. The islands are heavily subsidized by France, which benefits the standard of living. The government hopes an expansion of tourism will boost economic prospects, and test drilling for oil may pave the way development of the energy sector. This is a list of the extreme points of the European Union — the points that are farther north, south, east or west than any other location. The Mayotte national football team represents the French overseas department and region of Mayotte in international football.